Measures about 6¼” x 4¾”. Features a smooth enamel finish in a classic ivory color. Decorated with a silver beaded border. Mounted on a metal frame. Includes a 5″ x 3½” front glass panel to protect pictures. Packaged in its own white gift box. Has a removable hinged backing covered in velvet. Can be displayed horizontally or vertically. Ideal for a Dreamy Fairy Tale Theme. Measures 2″ x 2.1″ x 2″ inches. Has an inner velvet lining. Ideal as a bridal shower or anniversary gift. 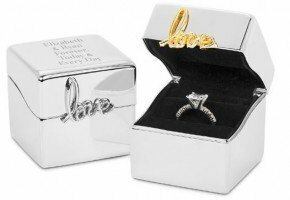 Perfect as a proposal ring box. A clear cube-shaped ring box. 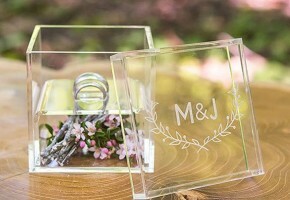 Makes a unique ring box for a modern wedding. Has a woodland-inspired laurel wreath on the lid. Fits most averaged-sized wedding bands. Ideal as a bridal shower or engagement party gift. Serves an unconventional alternative to a ring pillow. Measures 4 1/2″ W x 7 1/4″ H x 1 3/4″ D.
An antique-inspired jewelry box that resembles a book. 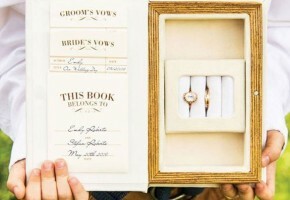 This book box includes a compartment for keeping the wedding vows and rings. Serves as a creative alternative to a ring pillow. This jewelry box opens and closes just like a book. A vintage-inspired box makes a wonderful gift for the bride. Available at Dessy (*affiliate link). Comes in colors of black, rose gold, soft white, and silver. These premium flats are easily fold-able. Made of textile (upper) and rubber sole. A great gift for the bridesmaids. Ideal as luxe favors for a wedding shower. Comes with a small pouch to hold the flats. Made with a beautiful moire fabric in a classic ecru color. Decorated with a pretty seashell brooch with tiny crystals. Measures approximately 6 ¼”x 4 ½”. Closes securely with a goldtone magnetic catch. Interior is lined with soft ivorycolored satin. 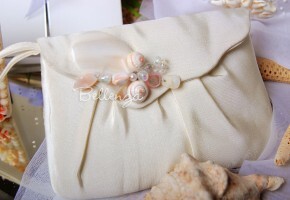 Each clutch bag is presented in a Bellenza signature gift box. 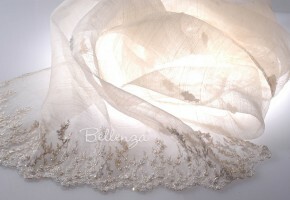 Great when coordinated with our Lúlucella Silk Bridal Shawl. Makes a wonderful gift basket idea! A wooden tray that measures 11.75″ x 11.75″ x 2.25″. Has a finish of white and aqua color combination. 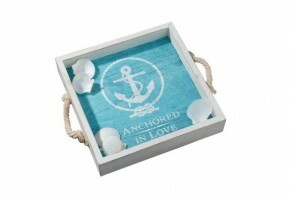 Features the message “Anchored in Love” on the inside of the tray. Has 2 ropes on the side to serve as handles. Perfect as an alternative guest book idea for a reception by the beach. Can be re-used at home as a wedding keepsake. Makes a practical engagement party, housewarming, or anniversary gift. Available at BHLDN (*affiliate link). Italian lace gloves with gold embroidered accents. Made of polyester and handmade in Latvia. Can be coordinated for a winter ensemble. Perfect for a vintage-inspired wedding. Measures approximately 66″ by 24″. Made of delicately sheer pineapple fiber silk (piña) in a classic écru color. Decorated with tiny glass beads, pearls, and sequins. Finished with an embroidered and beaded scalloped border at each end. 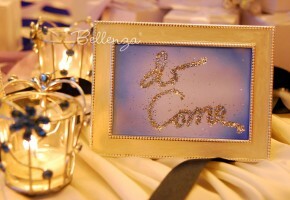 Presented in an elegant Bellenza signature gift box. Best coordinated with our Estrellene Wristlet Purse. Ideal for an ivory color palette. Perfect as a handmade bridal shower gift. For international ordering, please click. Features blush feathers (marabou) and polyester lining. Comes in S/M or M/L. Ideal for an old Hollywood-inspired wedding look. 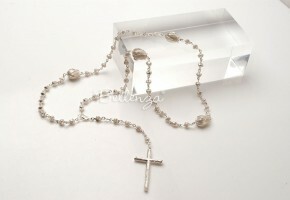 Features lustrous freshwater pearls as rosary beads. Divided into 5 decades with 10 pearls, each measuring 6-6 ½ mm. Crucifix is plated with 18KGP white gold, and measures 1 ¼” inches. Large pearls dividing each decade measure 9-10 mm. Smaller spacer pearls measure 2-2 ½ mm. Chain is decorated with .925 sterling silver stardust beads. Features a double hand-knotted construction. Total length is 16″ inches. Ideal as a bridal bouquet accessory. Features a sterling silver crucifix, about 2″ in length. Has 5 decades constructed of ten small rosebud beads, each 0.25″ in diameter. Each decade is separated by a large rosebud bead, 0.50″ in diameter. The drop of the crucifix chain is about 3″ long.